One of the most important principles in technical analysis is to trade in the direction of the trend: buy when the stock is trending up. In other words, buy on strength and sell on weakness. The major trend (in effect for at least six months) is up. The intermediate trend (in effect for three weeks to three months) is up. The near-term trend (in effect for two to three weeks) is up. Dundee traded in a consolidation range of $30-$31 since November, 2010. There is a tentative breakout at $32. Will it hold? 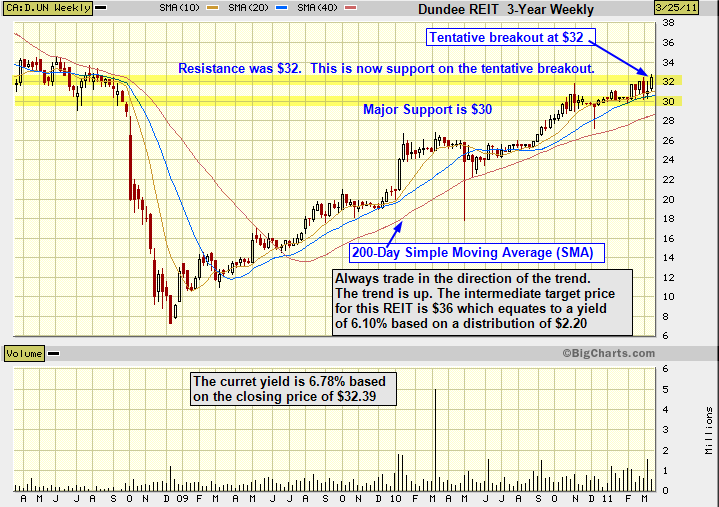 A target price of $36 is reasonable based on the chart and fundamental data. Dundee REIT owns high quality office properties across Canada. Review the fundamental data for Dundee REIT detailed on their website. RioCan REIT, the biggest Canadian REIT listed on the TSX, was featured on this site March 8, 2011. A Financial Post article with reference to Dundee REIT: Be picky in strong 2011 for Canadian REITs. A Globe and Mail article with a positive reference for Dundee REIT and REITs in general: A healthy year of gains seen for REITs. Note: This technical analysis is for educational purposes so you can learn to trade online using candlestick charts. Please conduct your own chart analysis or consult your financial advisor before making investment decisions. The chart snippets are from BigCharts.com which I recommend and have used for fifteen years. The author of this article may hold stock in the featured company but is in no way associated with the company. This entry was posted in Stocks and tagged Dundee REIT, REIT, resistance, support, Technical Analysis on March 26, 2011 by Trader.